A few weekends ago I had the immense fortune of spending a few days in Northern Michigan – the Upper Peninsula for those familiar with Michigan geography. On an island off the coast, to be exact. But not too exact, should readers be tempted to go looking for this slice of Eden and overrun the place. Having very recently returned home from another small weekend adventure, I had settled into my domestic routine not more than four or five hours when my psyche said “Well, that’s enough. Where to next?” Luckily, I was given the answer the next day – an opportunity to visit my parents and some long-time family friends at their cottage in the north. Lately the phrase “comfort is overrated” has been clanging around in my head. – Coming to the realization that greatness rarely comes from doing the same thing time and again. So when this particular opportunity came up, there were a host of reasons I could have said no thanks but chose instead to say yes, and work it out later. No? Too far; too short of time; too last-minute; where would I sleep; I haven’t seen them in a decade – that’s a lot of pressure…. Or, how about yes: My brother went and loved it; they’ve been asking me up for years; a great opportunity to travel with the folks; see someplace new; get out of the comfort zone; do some traveling independent of the man and dog. Yes, it was. Head north, young person. As is usually the case with the universe, my fortitude was handsomely rewarded. It’s easy to forget how wooly and wild the Upper Peninsula is, but the landscape changes just a mile from the Mackinaw Bridge – rugged, fresh, dense with pines. The day was blustery, with a chilly mist and growing wind. The bumpy boat ride to the island was just the first in a series of little personal adventures. I was once told that no one really cares if you branch out. (In truth, it was a reference to trying a new dish at a restaurant, but it holds up under closer scrutiny nonetheless.) And the adage is pretty much true – tweaking a few personal choices here and there rarely impacts anyone else’s life, but that’s not to say it isn’t important. Maybe that makes it better – it takes the pressure off. Mission accomplished. My short getaway provided ample opportunity to change up my usual preferences. Do I want to sleep alone in a tiny weird cabin? Yes. Would I like fish and potato salad for dinner? (Even though I shudder at both.) Yes. Would I like to jump in the lake to wash my hair even though it’s only 60 degrees outside? Yes. Comfort is overrated. 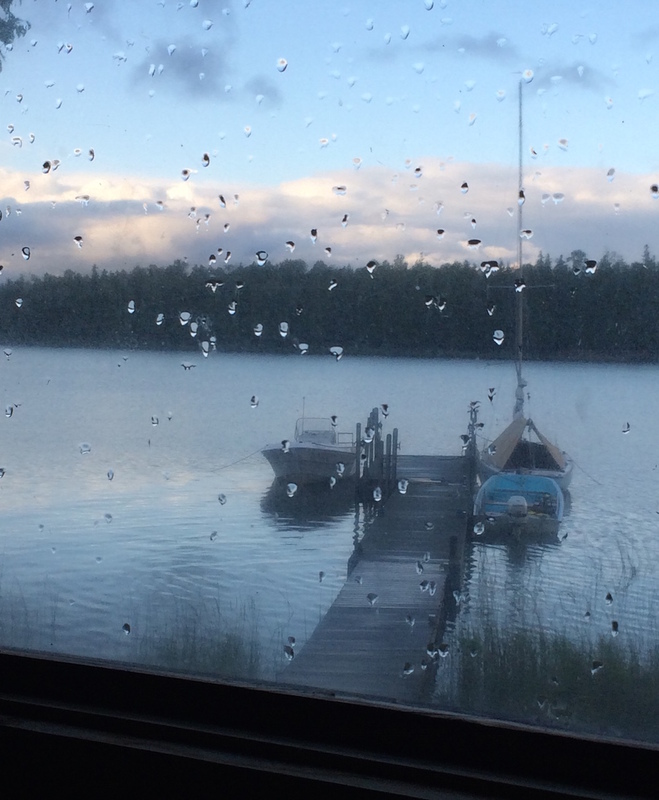 And as it turns out, the cabin was cozy, private, with beautiful view of the lake at sunrise. The fish was genuinely delicious, not just “good for fish.” The lake swim was brisk, but fun – clean, refreshing. The weekend was also as I’d hoped, a great few days to catch up with my parents and family friends. After hearing about it for years, it was special to visit to their cottage and see how they live on the island. Great food, conversation, a lot of laughing – the good stuff, really.